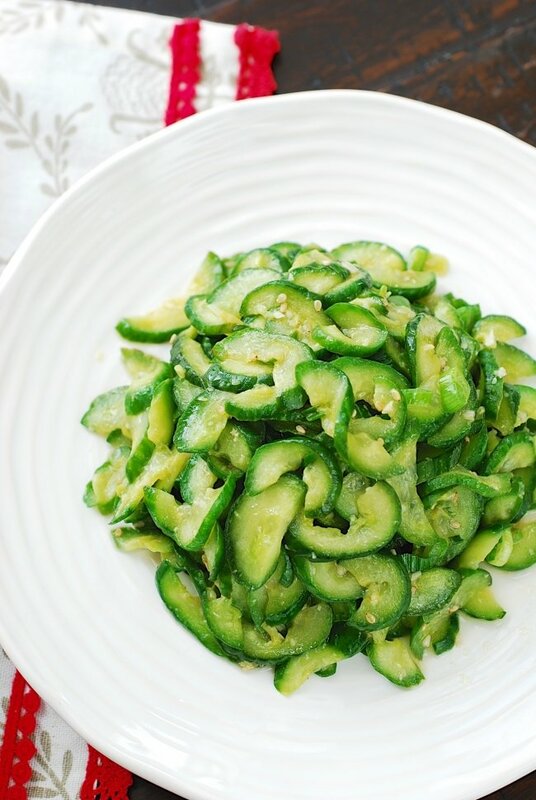 This stir-fried cucumber side dish is quick and easy to make. In Korea, it’s called oi bokkeum (오이볶음). 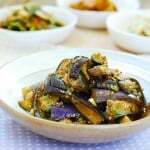 Oi is cucumber, and bokkeum means stir-fried. 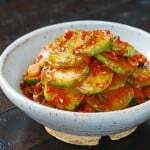 Cucumbers are more commonly prepared raw, salted, and seasoned either mildly or spicy for Korean side dishes. 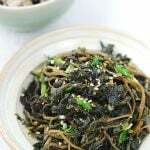 In my bibimbap recipe, you can find a mildly seasoned cucumber side dish, and spicy oi muchim is always very popular. 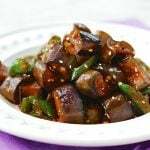 I know stir-frying cucumbers may sound a little strange to some of you, but stir-frying cucumbers is not uncommon among Korean cooks. 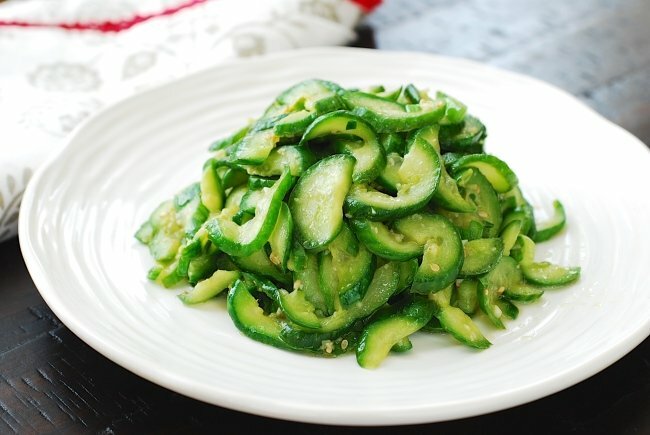 Stir-frying brings out the sweetness of the cucumbers, and it’s quite delicious! 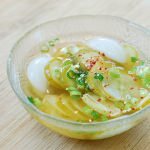 It will be a nice addition to your Korean side dish repertoire. 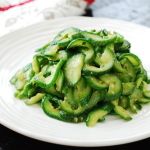 Any thin-skinned, crunchy variety of cucumbers are good for this dish. Right now, Persian cucumbers are abundant in markets. 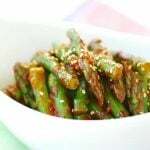 They are crunchy, sweet, and have delicately thin skin, making it perfect for this dish. 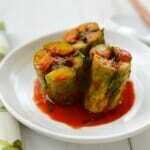 English cucumbers, which are usually sold wrapped in plastic, are also great for this dish. You need to lightly salt the cucumbers first to draw out water, and then tightly squeeze out as much water content as possible. 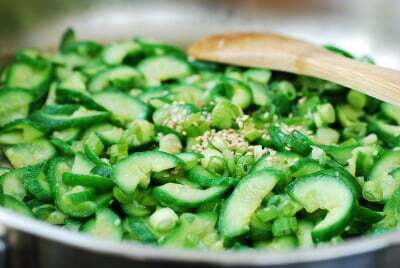 This process keeps the cucumbers crunchy even after being stir-fried. 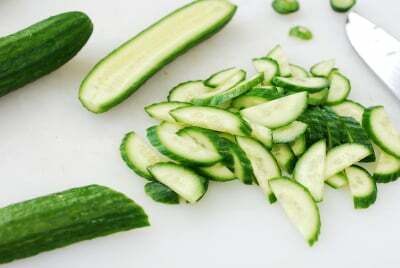 Cut the cucumbers in half lengthwise, and then thinly slice crosswise slightly diagonally. 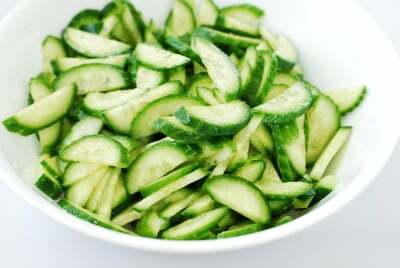 If the cucumbers are thin, you can simply cut into thin rounds. 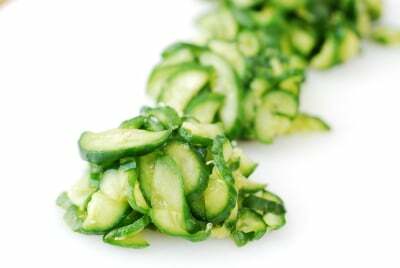 Toss the cucumber slices with one and a half teaspoons of salt to coat evenly. Let sit for 5 minutes. Squeeze as much water out from the cucumber slices as possible. Don’t worry about bruising them. They will recover when stir-fried. Heat a pan over high heat. Add 1/2 tablespoon of cooking oil. Quickly stir in the garlic. Add the cucumbers. Stir-fry for a minute until the cucumbers are slightly cooked. Turn off the heat. 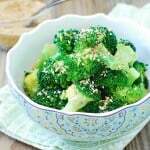 Toss well with the scallion, sesame oil, and sesame seeds. In 1998-2000 I was in ROK, teaching English. My students took me to a very nice restaurant for a meal, a treat I always enjoyed and appreciated) Even though the HOT foods could be a challenge. I always found something I could enjoy. At this very nice restaurant, they served a “dessert” I enjoyed, tried to learn about, and never saw again. What I think I learned from my students, it was a slice of soybean “cake” with a light, airy sponge texture. It was mildly sweet, and very tasty. Do you know what that woulld be? Do you make it? I want to learn about it. This is delicious! It’s the only way I can get my daughter to eat cucumbers. How long can I keep this in the fridge? Will it lose its crunch if eaten the next day after making? Hi Julie – Nice to hear your daughter likes cucumber this way. It will be fine the next day, but this dish is best to eat within a couple of days.